A Little Bit of Magic: Birthday on Land, and on the sea! After awhile we began to walk around the world Showcase. It was so much fun walking around, wearing my birthday button like a badge of honor! (My friend made me on with a big 21 on it. I got a free Margarita in Mexico!) We finally stopped in Germany, to one of the best kept secrets in all of Epcot, Karamelle-Kuche. Best Caramel Popcorn on property. We didn't get Popcorn. My friend got a caramel apple, and I got a caramel drizzled brownie. (Not very good, Why was it so dry?) But the CM noted my birthday button and I got a free chocolate covered marshmallow as a treat! Yum! But the best part of my actually began before I went to Epcot. I know, 'How can there be something more exciting than spending your birthday at the Happiest Place on Earth?!?' 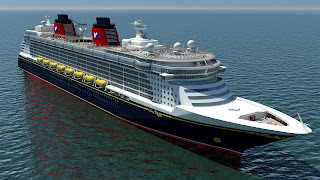 Well, In December I will be off the grid for four days as I am GOING ON A DISNEY CRUISE! Oh yeah, my roommate and I are going to spend some time on the Disney Dream, going to the Bahamas, and getting some well deserved R&R. I've got 22 days to do as much research as possible. 22 days to get cruise clothes, 22 days to get my kindle ready with the perfect reading material (Shada? Yes?) 22 days to get mentally prepared to GO ON VACATION!